This organically grown Thai basil plant comes in a reusable bamboo pot. Medium green leaves with purple stems and flowers. An attractive plant. 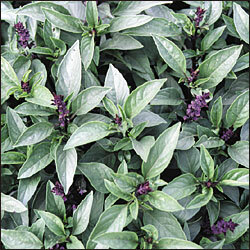 The flavor of Thai basil has an anise or licorice flavor blended with a basil flavor. Unique for Thai dishes. Makes great pesto mixed with Italian Basil.